Smartphone maker company Asus, Realme and Lenovo recently launched their budget smartphones in India. Asus, Taiwan's smartphone maker, Asus Zenfone Max M1, while Lenovo launches Lenovo K9 smartphones. These two budget smartphones launched in August and it will be competing with Realme 2. Let's know Realme2, Lenovo K9 and Asus Zenfone Max M1 challenge each other in terms of price, specifications and features. There is a 6.2-inch HD + display (1520x720 pixels) with a 19: 9 aspect ratios in realme 2. The Lenovo K9 has a 5.7-inch fullscreen display with an aspect ratio of 18: 9. Zenfone Max M1 comes with Dual SIM slot and comes in two colors. It has a 5.45 inch HD + display, which has an aspect ratio of 18: 9. Realme 2 has RAM, so it is available in 3 GB RAM + 32GB storage and 4GB RAM + 64GB storage variant. The Zenfone Max M1 has 3 GB of RAM and 32 GB inbuilt storage, which can increase up to 256 GB via microSD card. Lenovo K9 is a smartphone with support for Hybrid Dual SIM, which has 3 GB of RAM and can be expanded to 128 GB. Dual rear camera setup has been given in Realme 2, which has a primary sensor of 13 megapixel with F / 2.2 aperture and 2 megapixel secondary sensor with F / 2.4 aperture. Speaking of the front, Realme 2 has an 8 megapixel selfie camera with F / 2.2 aperture. Lenovo K9 has an 8 megapixel AI Self camera with 13 megapixel AI main camera and Bokeh improvment. It also has a finger-print sensor with Face Unlock feature. Speaking of Zenfone Max M1 camera, it has 13 megapixel rear camera with aperture F / 2.0. There is an Eight megapixel (8 - Mp) front camera with aperture F / 2.2 for selfie and video calling. Both cameras come with LED flash. Realme 2 has an Octa-core Snapdragon 450 processor. The Lenovo K9 phone has a 3 GB RAM with a 2.0GHz octa core processor. Whereas Zenfone Max M1 has a quad-core Qualcomm Snapdragon 430 processor. Realme 2 has a 4230mAh battery. There is a 3000mAh battery for Lenovo K9 Power. For connectivity, it offers standard features such as Wifi and Bluetooth with 4G VoLTE. Also the USB Type-C is provided. Apart from this, fingerprint sensor has also been provided with Face Unlock feature. Android OSO operating system has been given to power Zenfone Max M1. The realme 2's 3 GB RAM and 32 GB storage variant is priced at Rs 8,990 while the 4 GB RAM and 64 GB storage variant costs Rs 10,990. The same thing is Lenovo K9, so its 3 GB RAM variant is priced at Rs 8,999. The price of Asus Zenfone Max M1 is Rs 8,999 and it will be available at the introductory price of Rs 7,499. 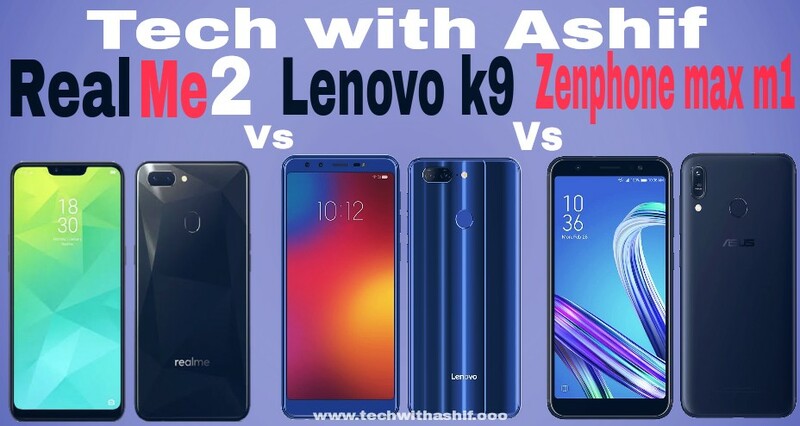 After watching friends, Realme 2 vs Lenovo 9 vs Asus Zenfone Max M1, price, specification and feature, we have come to understand what phones can be best for you on these smartphones. Please share in the comment about what you think about this phone.